Once again, I got carried away with my preserving. This time it was with lemon and pink grapefruit marmalade. And while it is delicious, the recipe is HUGE and I ended up with 14 half pints of marmalade. Just a quick note on this marmalade recipe, it is from a book called The Blue Chair Jam Cookbook by Rachel Saunders. This book has some great tips on making jams and jellies without added pectin, and I have really enjoyed reading through it for inspiration. This recipe is based on a recipe for croissants a l’orange that my husband and I had on our honeymoon. It’s been twenty years, and I still make that recipe and remember the bed and breakfast we stayed at in New England. I don’t make the recipe too often, however, because croissants aren’t a standard on my shopping list. This version of the recipe uses brioche bread, which I’ve found at Trader Joe’s. 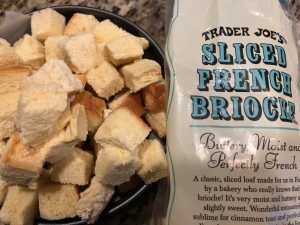 I cut the slices into cubes and then freeze whatever I don’t use in the bread bag for the next time. One loaf makes about three of this recipe. Sometimes, it is fun to step a recipe up a notch. In this case, I’d recommend adding chocolate chips or chopped dark chocolate to the bread and egg mixture. If you’d like additional tips on making bread puddings or French toast in the pressure cooker, see my recipe for Cinnamon French Toast for the Instant Pot. Add 1 cup of water to the pressure cooker and place a trivet in the pot. Make a tin foil sling if your trivet does not have a handle to remove your dish. Line a 7-inch cheesecake pan with parchment paper to prevent the milk mixture from leaking out. If you don't have a cheesecake pan, you can use a pyrex dish that fits into your pressure cooker. Spray the cheesecake pan or dish with cooking spray. Fill your baking dish with the cubed bread and mound the cubes over the top of the dish. This is how much bread you need for the recipe. Any extra can be frozen for another time. In a large bowl, combine the milk, eggs, vanilla, almond flavoring, marmalade, brown sugar, and chocolate chips (if using). Whisk lightly to combine and break up the marmalade. 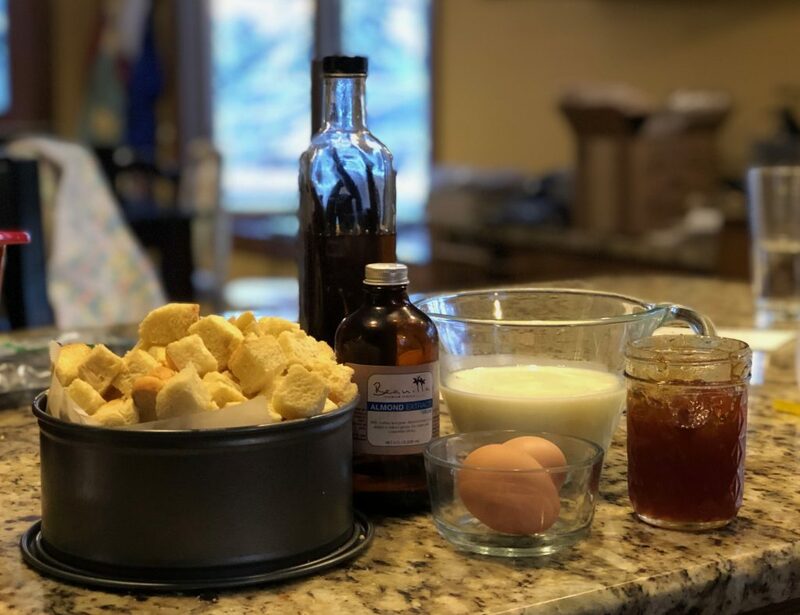 Toss the bread cubes into the egg and milk mixture. Pour the bread cubes into your prepared pan. Cover the pan with a paper towel and a piece of tin foil to keep out the moisture. Make sure the cooker is set to seal and cook on high pressure for 15 minutes. Turn the keep warm setting off. After the cooking time is completed, allow the pressure to naturally release for 5 minutes and then manually release the remaining pressure. The French toast is ready to eat at this point, but if you'd like to crisp up the top, pour the melted butter on top and place under the broiler of your oven for a few minutes until the top is lightly browned. You know apple butter is ready when no liquid pools around the edges. 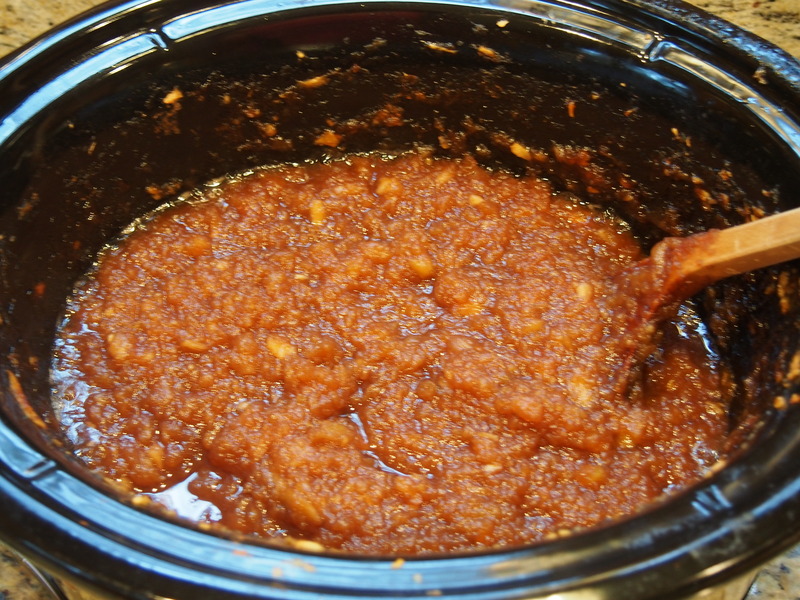 In recent years, I have avoided making apple butter. My last memory of it involved thinking, “Boy, this just tastes like spiced applesauce.” So I didn’t bother with it for a couple of years. And then this year, a friend asked me to make her some and I had an overload of apples. So, I figured I may as well give it another shot. Worst case scenario, I was planning to make my girlfriend take the entire batch of apple butter. 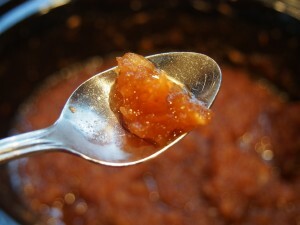 Apple butter is really great on homemade toasted bread or added to plain yogurt or oatmeal. I also love it on my whole grain waffles with toasted pecans and a little whipped cream. A friend told me just today about making cinnamon rolls with apple butter as the filling. I’m going to give that one a shot in the very near future, because it sounds like the perfect fall treat. So this time around, I did a few things differently. First, I did not puree the butter like a lot of recipes call to do. Instead, I chopped the peeled apples up at the beginning using a food processor – almost to a chunky applesauce consistency, but not quite. If you don’t have a food processor, you can just put the quartered apples into the crock pot and use an immersion blender on them once they are soft and mushy. Or just run it through a blender or food mill and you’ll end up with a smoother consistency. I also played with the liquid on this recipe. Instead of using water as the liquid, I made one batch using apple cider and a second batch using hard apple cider. Honestly – they really didn’t taste much different. I was honestly hoping that the trendy hard apple cider version would be amazingly better than the old fashioned version, but not so much. But either one of them provides a little more flavor than using plain old water. Crock Pot Apple Butter = almost done. I did this recipe in the crock pot. I really love this approach. It’s pretty hands off. You can stir it periodically, but really, you just let it do it’s job until the end when you jar and can it. The main trick with the crock pot approach is to leave your wooden spoon on the edge of the crock with the lid on so that the lid is cracked open for most of the cooking time. You’ll know that the apple butter is done when the liquid is mostly gone. You should take a little bit and put it on a spoon or plate – let it cool a couple minutes and check to see if any liquid pools at the edges of the butter. Once there is no liquid, then the butter is done.